Looking for private in-home or in-studio Music Performance lessons? Our Bryn Athyn teachers are ready to get you started. Find your teacher today! Check out some of our most popular teachers near Bryn Athyn, PA including Philadelphia, Princeton, Wilmington, Trenton and West Chester. This is a group class for two or more students interested in learning to perform in a band setting. After the group has prepared three or more songs, they are ready to perform at our studios monthly showcase! Andrew is a graduate of Musicians Institute College of Contemporary Music in Hollywood, California with a degree in drum/percussion performance. Andrew spends his time teaching drums, recording drums and playing drums for local artists/bands. While in Los Angeles he performed with many independent artists and also had the privilege to work with some well know artists, such as Scott Shriner of Weezer, Nikki Sixx of Mötley Crüe, and The Blue Man Group. ol, Pasadena City College, LA Valley College, LA Academy, Music Training Center and several other institutions. My goal for the first lesson, is to get to know my student. I want to find out who their favorite bands/drummers are, what their lesson goals are and most importantly, how they learn best. I can adapt my teaching approach to suit each individual student. I am patient and encourage my students to practice. I believe that anyone can become a drummer. "Light and Sound Studio" is a full service audio/video/lesson studio with state of the art equipment. I teach reading and writing music notation as well as to play by ear. I specialize in Jazz, Rock, Blues, Country, Metal, and Latin styles. I know heel-up, heel-down, and heel-toe bass drum pedal technique. Andrew is teaching my daughter snare drum for marching band tryouts in the spring. The first lesson was excellent and she looks forward to working with Andrew in more lessons. The lesson with Andrew was very straight forward and alot of positive came out of . Andrew was very understandingvfor the type of lesson I am looking for. We will see what happens during the rest of my 5 lesson series. I liked Andrew right off the bat seems like a nice person also. I am 71 years old I know when I meet someone after a few minutes what kind of person they are and he is one of those type. I worked with Andrew for over 2 years learning the drums. Fabulous teacher! Andrew taught me technique, timing, different genres of drumming but most importantly inspired me to keep stretching in my playing. His love of music shines through his teaching. From age seven, I have performed piano at concerts and piano competitions, playing solo, in small groups or with orchestra. Studying piano performance at the School for Talented Children for eleven years and later at music conservatory, I was groomed to perform piano on stage. In short, I have the personal experience that I apply to teaching piano performance. Specifically, I teach my students how to memorize music pieces, how to develop proper phrasing and how to convey emotion and beauty of a particular piece to the audience. I also help students who want to obtain certificates from Associated Board of Royal School of Music (ABRSM) or Trinity College London (TCL) to excel in these examinations. Music has been one of my greatest passions since I was a little girl, and teaching it is my favorite way to share my love of music. I teach students of all ages and skill levels from early beginners to experienced piano players who want to bring their performance to a higher level. em from playing beautiful music. Ruth quickly tailored the lesson based on my experience level, and helped me so much in just 30 minutes! I look forward to our subsequent lessons. I took 5 lessons with Ruth for 5 weeks., and it has been a great experience! Ruth is an engaging, encouraging, and friendly teacher. My goal was to learn the basics to play piano and she was really helpful for me to teach effectively in 5 classes. Thanks you very much Ruth.All the best. Ruth was conscientious about starting my son at his proper age and learning ability. I have been singing for as long as I can remember. It is my very favorite activity. I have transformed my love of singing into a career. I have been teaching music lessons for over 25 years. When you study with me you will have the advantage of that experience. I have extensive experience teaching students of all ages. Throughout my teaching career I have taught students with varied backgrounds and diverse needs. If you are a person who was told not to sing by your music teacher, don't give up! I have taught many children and adults to match pitches and improve their singing voices. s in Early Childhood and Elementary Education at West Chester University. I served on the faculty of Suburban Music School for 17 years where I taught voice, piano and recorder lessons. I also directed the Children’s Choir and the Women’s Choir. I was formerly on the faculty of Delaware County Community College where I taught courses in the Music Department; and of Temple Music Prep where I instituted, developed and maintained a vocal program at Temple University’s Ambler Campus. In addition to teaching I was employed for eleven years as a chorister at Christ Church Christiana Hundred in Greenville, DE where I have had the opportunity to sing for such notable conductors as John Rutter, Sir David Wilcox, Sir Philip Ledger, Stephen Cleobury, and James O’Donnell. Previous choral work has included singing for Dr. Ifor Jones and for Michael Korn. I perform in solo and chamber music recitals throughout the Philadelphia area and in Cape May, NJ and with a Celtic group called Celtic Women and Friends. When you study voice with me, you will start with the basics - posture, breathing and tone production. If you have studied before, we will review these areas and brush up on anything that needs work. The next step is to learn some vocal exercises to warm up and develop your voice. When the exercises are going well, we will begin to work on songs. You will need to learn some classical songs because they help to develop your voice, but we will also work on the kind of music you like best. In addition to songs, we will work on solfege (do, re, mi, etc.) which helps to train your ear and to improve your sightreading ability. If you don't know how to read music I will teach you that. If you read music but have some gaps in your knowledge, we will fill those in. I teach what is called bel canto (beautiful singing). It is a healthy vocal technique that will help you avoid vocal problems. When you learn to sing with this technique, you can sing any style of music you want. After a few months of study, you should be able to tell that your voice is growing stronger, that you have better breath control, and that your range is increasing. Although I have high expectations of my students, I am relaxed and friendly. If you love to laugh, we will enjoy that together! When you study piano with me you will enjoy playing a variety of songs from your lesson book. As you advance, we may add a repertoire book which increases the number and variety of songs you play. There are many excellent piano methods. I use different methods for different students, depending on their needs. 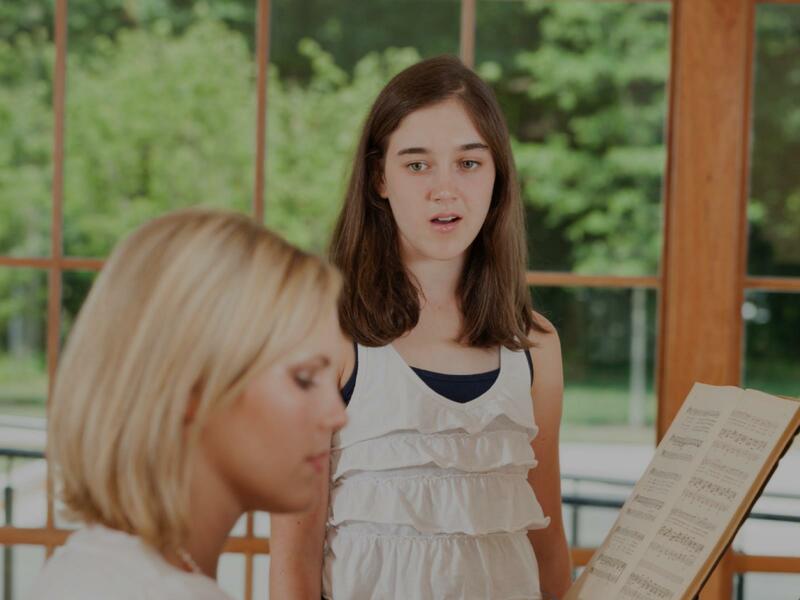 Lessons will include posture and proper hand position, warm-ups, songs and music theory. Music theory is the study of notation and how music is put together. You will have a workbook with exercises for this study. If there is a particular style of music you would like to play, we will look for music at your level to add to your lesson. After a few months of study, you should know how to read basic notation and be able to play a number of songs. You will also have increased your knowledge of musical notation and harmony. I expect my students to practice in preparation for their lesson every week. I am relaxed and friendly, so that should help to put you at your ease. I specialize in teaching the bel canto style singing. With this technique, a person can sing any style of music she or he chooses. My granddaughter Kayla really enjoyed her first singing lesson. She was a bit nervous at first, but Barbara made her feel relaxed. Kayla felt that Barbara was patient with her and answered her many questions. Kayla is looking forward to next week and thing she can learn to help her sing better. My daughter never had singing lessons before. Barbara is great with at explaining things to her. Great experience so far! In such humble surroundings, I have found a diamond. She teaches gently with gréât knowledge of thé human voice. I am so gratified to have found her. Please ignore any accents that appear in this paragraph. I have been writing in French most recently and have not been able to convert back to English spelling conventions. Stated simply, Barbara is a jewel of a teacher. All aspects of music performance are covered with a focus on stage presence, physicality, and emotional awareness. It's one thing to master an instrument, it's a whole other thing to perform it in front of people! I will help you feel confident and give you a set of tools to use for every performance you make! I mentor and guide students who want to play as free lance musicians in various playing situations including wallpaper gigs, recitals, concerts, etc.. I prepare students for various performance situations and instruct them on proper preparation techniques. I teach children, adolescents , and adults. I have also worked with special needs populations for many years in a variety of settings. I am very patient adept and compassionate. I am also very skilled at my instrument as I studied music at the University Level. My goals are to combine my experience teaching special education with my experience studying and teaching music performance. I am very enthusiastic about teaching students at advanced levels as well. I teach piano and drumset. I teach various styles of music and hope to engender my students' love for music and the arts. I consider myself a mentor, a Music Therapist, and an educator. David explains things in a manner that I could easily understand. He was calm, patient, and respectful of skill level. Awesome teacher! Not just a great drummer, but patient and articulate. He was really able to help me understand and execute in ways I never could before. Seems like he would also be great with kids...super patient and encouraging! David is a very skilled drummer and a very enthusiastic teacher. In lessons, he seems to like to split time between practicing rudiments and learning to play different rhythms on the set. He is also exceptionally patient and supportive with my 9-year-old, highly distractible daughter. David is very positive, pointing out things that are going well and interesting rhythms that they discover. I am really glad we found David--he is an excellent teacher and I love watching my daughter learn so much about music! Learn performance technique and stage presence tips in piano and/or voice. Hi! Thanks for visiting the about the teacher page. I’m Jeannine. I’m a graduate of Berklee College of Music with 15 years of professional teaching experience in an abundance of settings. As a private educator, I’ve been employed at top music schools throughout the northeast teaching voice, piano, and songwriting, while simultaneously working extensively as a recording artist, composer, and performer. I’ve taught and/or directed over 1,000 students from the ages of 2.5-87.
s and ADD/ADHD). I studied pedagogy at the graduate level at Hunter College in NYC, and have served as a music director and accompanist for countless school productions at the middle and high school level. In my own music career, I’ve worked comprehensively in the industry as a songwriter, performer and recording artist. I’ve released two albums of my original music, and have written, recorded, and arranged for numerous independent and label-signed acts throughout the US. I’ve toured nationally, appearing with grammy nominated and award winning artists, while working regularly performing at weddings, corporate events, and restaurants. My students range from hobbyist musicians to budding professionals. Many are involved in music additionally through school and community, and most audition and perform on a regular basis. Past students have gone on to study music in college and perform at the professional level, releasing their own albums, and appearing as contestants on competitive singing shows. I forge long-lasting relationships with my students, and have worked with all of my current students for years. I can assist in in preparation for college auditions, state and regional competitions, and musical theater auditions (as well as provide accompaniment for any of these situations). Additionally, I am available to provide tutoring for AP music theory, placement, and PRAXIS exams. Jeannine was amazing! She could not have done a better job!! I had 0 singing experience and after just one double session, I had learned more than I ever expected!! I love teaching. I go into every lesson with the belief that the student is there to learn; if they weren't interested in learning, they wouldn't be there. Because I have always had diverse musical interests, I create a stress-free atmosphere for my students by allowing them to pursue whatever avenues of music interest them. My degrees may be in Jazz Studies and Performance, but I have extensive experience with Classical and Popular music; I provide a unique perspective and enthusiasm to every student. o perform as the “jazz trumpet” chair in part of Disney’s highly selective All American College Band. After graduate school in Evanston, IL, I moved into the heart of the city of Chicago. For 3 years, I played trumpet and sang jazz standards most Thursday evenings at the famous Green Mill Cocktail Lounge, one of Chicago’s oldest jazz clubs. In addition to that, I helped start The Syndicate, my hip-hop brass band that offers a blend of funk, R&B and jazz. I also played with other groups such as Four Star Brass Band, and J-Livi and the Party, which released an album in July of 2016 called “Come and Share My Life," whom I still play with. Mike is a kind, warm, knowledgeable teacher. His expertise in various vocal styles is what I love the most. He can comfortably teach and sing opera, musical theater, pop, and jazz. I love working with Mike! Mike is an incredible performer and a very thoughtful musician. I have performed with him several times and he always holds himself and others to a very high standard. I got better by singing with him! I know he takes teaching very seriously and I can say from personal experience that my musicianship improved just by being around him. What do you offer for a beginner? Assuming a student has never played a piano and is 10 years old or older, lessons will focus on fundamentals of technique and sight reading classically oriented material. I follow piano curriculum developed by John Thompson and Alfred. For students under 10 years of age without any prior piano training, a preparatory book may be used. After a minimum 6-12 months of continuous piano lessons (assuming a weekly schedule), music theory will be introduced, along with chord playing. What do you offer for a non-beginner? Assuming a student has had a minimum of one year of continuous piano training, depending on the lesson customization, lessons will be based around the Alfred and/or John Thompson curriculum, and music theory and chord playing will be introduced. Can't find a teacher in Bryn Athyn, PA? ional and a pleasure to work with, Shanita understands how to interact with her audience and shines in a diversity of vocal styles, from Jazz to Pop and Reggae." Philadelphia, PA teacher: Shanita J.
igh standard. I got better by singing with him! I know he takes teaching very seriously and I can say from personal experience that my musicianship improved just by being around him." Philadelphia, PA teacher: Michael J.
e is able to communicate his learning and how approachable he makes any topic seem, whether discussing the finer points of polyrhythms, tonal analysis, brass embouchure, or vocal pedagogy, to name a few. Whether you've been looking to dig deep into your musical training or seek to brush up on a broader range of musical topics, I would highly recommend working with Mike. It will be time very well spent." Elicia has help me learn what I always wanted to since I have started playing again I am now expanding my quartet repetoire." "Simply amazing. Best decision I've made in a long time."